What started as a visit to a friend in December 2013 turned into the moment that would change everything. Chris, a UK native, was in Greenville seeing the city where a longtime friend had moved a year prior, and he and Lauren first crossed paths. The two quickly hit it off, and Greenville native Lauren showed Chris around her hometown for the remainder of his visit. Lauren and Chris vowed to make a (very) long distance relationship work, and so the two flew back and forth across the Atlantic visiting one another. The distance was tough, remembers Lauren, but "we had lots of amazing travel both in the US and in Europe together!" In December 2015, they got engaged, and Chris made the move to the U.S. in 2016. Soon after, the pair moved to California, which made planning for a wedding back in Greenville a bit more complicated. This pair was used to long-distance planning, so they assembled a trustworthy team to ensure that their wedding day would be perfect. Among that team was photographer Jessie Modlin of Jessie Modlin Photography who was along to capture every moment of this casual bohemian-meets-classic wedding in downtown Greenville. While Greenville is gorgeous year round, there are few times when it is prettier than in the fall months. 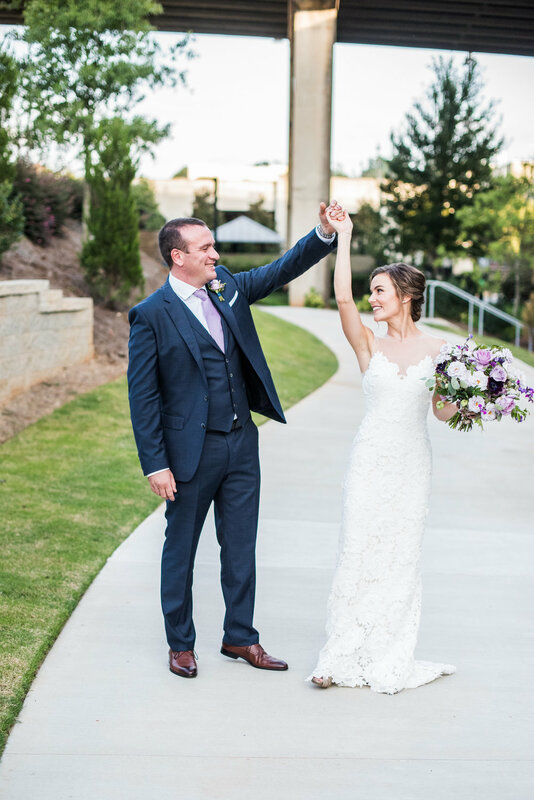 Bride Lauren particularly loves her hometown in the cool, crisp months, and she and Chris said, "We wanted our friends and family who were traveling to Greenville to see it at its best." They ultimately choose Avenue for its indoor and outdoor event spaces, so that their wedding guests would be comfortable no matter the weather on that particular day. Lauren and Chris, who were already living in California during the planning, had to rely heavily on Lauren's mom to keep them informed about the details. In fact, the couple booked Avenue before it had even finished being built! Between her mom's site visits and the detailed venue vision board, Lauren and Chris knew that it would be perfect for their nuptials. When planning their wedding, Lauren and Chris wanted something that was relaxed, casual, and unfussy. "Our biggest goal was to celebrate the moment with each other, our families, and our closest friends," stated Lauren. So, they went about including as many personal touches throughout their special day as possible. When her paternal grandmother passed away just days before the ceremony, Lauren chose to honor her memory by pinning a vintage cameo brooch of her grandmother's to the bridal bouquet. Lauren's maternal grandparents provided their own cake topper and guest book for the couple to use once more, and their cake knife had been a wedding gift to Lauren's parents three decades prior. Hidden from sight of the guests were two additional tokens: sixpence coins that Lauren placed in her shoes. One was a gift from her father-in-law dated 1887, 100 years before Lauren was born. Lauren's aunt gave her the second, which was from the year her grandparents had married. It's difficult to keep track of every detail when planning any wedding: add in cross-country planning, and sometimes, there are a few surprises! Lauren and Chris picked their fall date because of the natural beauty and crisp temperatures, so they didn't realize that the same weekend would see thousands of people flocking to downtown Greenville for the annual Fall for Greenville festival. "We had a moment of freaking out initially, and then decided it would bring extra fun for our out of town guests," said Lauren. All's well that end's well, and their venue was just far enough from the festival on Main Street that the music and noise didn't interfere with any portion of their day. And, as photographer Jessie recalls, "Their wedding was so elegant and classic that no one attending would have even known there was anything other event in town that weekend. Their wedding stole the show and had the Greenville skyline as icing on the cake."